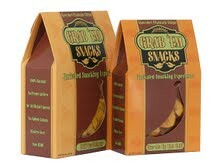 Grab ‘Em Snacks’ plantain chips easily passed a taste test with my co-workers last week. I was given three flavors to try by a representative of the Hillsborough-based company (thanks Timothy!) – Sea Salt Goodness, Fire-Me-Up Red Chile, and Cinful Cinnamon. They are delicious, I kid you not, one of the more addictive snacks I’ve sampled lately. Whole Foods should pick these up, if they can make them fast enough! They look nice too, as they are cut lengthwise into curling ribbons, instead of small rounds. Try some next time you have company over – can you say Super Bowl?